Not to be confused with Semi-automatic pistol. The Russian Stechkin APS and suppressed APB select-fire machine pistols introduced into Russian service in 1951. A machine pistol is typically a handgun-style machine gun, capable of fully automatic or burst fire. The term is a calque of the German word "Maschinenpistole". They were developed during World War I, and originally issued to German artillery crews who needed a self-defense weapon, lighter than a rifle but more effective than a standard pistol. Today, machine pistols are considered a special purpose weapon with limited utility, and difficult for all but the best shooters to control. During World War I, the Austrians introduced the world's first machine pistol the Steyr Repetierpistole M1912/P16. The Germans also experimented with machine pistols, by converting various types of semi-automatic pistols to full-auto, leading to the development of the first practical submachine gun. During World War II, machine pistol development was more or less ignored as the major powers were focused on mass-producing submachine guns. After the war, machine pistols development was limited and only a handful of manufacturers would develop new designs, with varying degrees of success. The Steyr "Repetierpistole M1912/P16" was the world's first machine pistol. During World War I, a machine pistol version of the Steyr M1912 called the Repetierpistole M1912/P16 was produced. It used a 16-round fixed magazine loaded via 8 round stripper clips, a detachable shoulder stock and a rather large exposed semi-auto/full-auto selector on the right side of the frame above the trigger (down = semi & up = full). It fires the 9×23mm Steyr cartridge, with a full-auto rate-of-fire of about 800 to 1000 rounds-per-minute. It weighed about 2.6 pounds. Introduced in 1916, it is considered the world's first machine pistol, only 960 M1912/P16 were made. The Germans also experimented with machine pistols, by converting various types of semi-automatic pistols to full-auto, such as Luger P08 "Artillery Pistol" with its long barrel, detachable stock and 32-round drum magazine. It was issued to primarily German artillery crews who needed a self-defence weapon, lighter than a rifle but more effective than a standard pistol. It fired the newly developed 9mm Parabellum pistol cartridge, which was designed for low recoil without sacrificing penetration and stopping power. These machine pistols proved to be quite effective in close range trench warfare and led the Germans to develop the 9 mm Parabellum Bergmann MP-18, the first practical submachine gun. The Mauser C96 was introduced in 1896, it was one of the first commercially successful and practical semi-automatic pistols. During World War I, the Germans experimented with machine pistols by converting both 7.63mm Mauser and 9 mm Parabellum semi-automatic C96 pistols to full-auto. In the late 1920s, Spanish gunmakers introduced select fire copies of the C96 with 20 round detachable magazines. In the early 1930s, Mauser engineers followed suit, and introduced the Model 1932 or Model 712 Schnellfeuer variant, which included 20 round detachable magazine and a select fire mechanism allowing fully automatic fire at a rate of 1000 rounds/minute. During World War II machine pistol development was more or less ignored as the major powers were focused on mass-producing submachine guns. 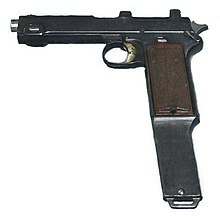 With one exception, the 9 mm Parabellum Browning Hi-Power machine pistol. The artillery version with its adjustable tangent rear-sight, shoulder-stock, 13 round magazine and later 20 round magazine was routinely converted to full-auto-only. In German service, it was used mainly by Waffen-SS and Fallschirmjäger personnel along with Mauser M1932 Schnellfeuer machine pistol. The 9×18mm Makarov Stechkin automatic pistol (APS) is a Russian selective-fire machine pistol introduced into the Russian army in 1951. Like the other common Russian army pistol of this era, the Makarov, the Stechkin uses a simple unlocked blow-back mechanism and the double action trigger. In addition, the Stechkin APS has an automatic fire mode, which is selected using the safety lever. In burst or automatic fire, the pistol should be fitted with the wooden shoulder stock; otherwise, the weapon quickly becomes uncontrollable. The Stechkin was intended as a side arm for artillery soldiers and tank crews. In practice, it earned a strong following in the ranks of political and criminal police, special forces and the like. Many KGB and GRU operatives favored the Stechkin for its firepower and 20 round magazine. The Škorpion vz. 61 is a Czechoslovak 7.65 mm or .32 ACP machine pistol developed in 1959 and produced from 1961 to 1979. Although it was developed for use with security and special forces, the weapon was also accepted into service with the Czechoslovak Army, as a personal sidearm for lower-ranking army staff, vehicle drivers, armoured vehicle personnel and special forces. The Skorpion's lower powered .32 ACP cartridge, coupled with a rate-of-fire limiting device housed in the grip (which allows a reasonable rate of 850 RPM with a relatively light bolt), also makes it easier to control in full-auto than the more common 9 mm Parabellum designs. Currently the weapon is in use with the armed forces of several countries as a sidearm. The Škorpion was also licence-built in Yugoslavia, designated M84. The Beretta M951R, was based on the 9 mm Parabellum Beretta M1951 pistol and produced during the 1960s in response to a request made by the Italian special forces. The primary difference between the M951R and the original M1951 lied in the fire selector lever mounted on the right side of the weapon’s frame, enabling either semi-automatic or continuous fire – labelled "SEM" and "AUT", respectively. Additionally, the weapon has a heavier slide, a folding wooden forward grip, the barrel was extended, and so was the magazine, increasing capacity to 10 rounds. The MAC-10 and MAC-11 were 1970s blowback designed weapons with the magazine in the pistol grip and a fire selector switch. The .45 ACP MAC-10 had a 1,145 round-per-minute rate of fire, and the 9×19mm version 1090 rounds-per-minute. The MAC-11 could fire 1200 rounds-per-minute with its .380 ACP cartridges. These guns were designed by Gordon Ingram and Military Armament Corporation in the US. The weapons used in special ops and clandestine applications in Vietnam and by Brazilian anti-terrorist units. It could be fitted with a silencer using its threaded barrel. While some sources call the MAC-10 and MAC-11 machine pistols, the guns are also referred to as compact submachine guns. Since it is difficult to control machine pistols when they are fired in full automatic mode, in the 1970s, some manufacturers developed an "intermittent-fire" setting that fires a burst of three shots instead of a full-automatic, such as the Heckler & Koch VP70. It is a 9 mm Parabellum, 18-round, double action only, select-fire capable polymer frame pistol. It was the first polymer-framed pistol, predating the Glock 17. The stock incorporates a semi-auto/three-round-burst selector. It will only fire a 3RB with the stock attached. Cyclic rounds per minute for the three-round bursts is 2200 rpm. Despite the VP70's potential, it was never adopted by the Bundeswehr. In 1976, a shortened machine pistol version of the 9 mm Parabellum Heckler & Koch MP5 was introduced; the MP5K (K from the German word Kurz = "short") was designed for close quarters battle use by clandestine operations and special services. The MP5K does not have a shoulder stock, and the bolt and receiver were shortened at the rear. The resultant lighter bolt led to a higher rate of fire than the standard MP5. The barrel, cocking handle and its cover were shortened and a vertical foregrip was used to replace the standard handguard. The barrel ends at the base of the front sight, which prevents the use of any sort of muzzle device. Another popular machine pistol using the three shot burst system is the 9 mm Parabellum Beretta Model 93R. Introduced in 1979 the Beretta Model 93R, a selective-fire machine pistol meant for police and military use. It offered extra firepower in a small package and is suited for concealed carry purposes such as VIP protection, or for close quarters maneuvers such as room-to-room searches. A selector switch and the foldable foregrip allows the pistol to fire three-round bursts with each pull of the trigger for a cyclic rate of 1100 rounds per minute. The designers limited it to 3 round bursts to make it be easier to control. A 20-round magazine and a metal shoulder stock may also be fitted. The Stechkin APS made a comeback in the late 1970s, when Russian Spetsnaz special forces units in Afghanistan used the suppressor-equipped APB variant for clandestine missions in enemy territory, such as during the Soviet–Afghan War. Argentine special forces with a Micro UZI. The 9 mm Parabellum Micro Uzi is a scaled-down version of the Uzi SMG, first introduced in 1983. It is 460 mm (18.11 inches) long with the stock extended, and just 250 mm (9.84 inches) long with the stock folded. Its barrel length is 117 mm and its muzzle velocity is 350 m/s. Used by the Israeli Isayeret and the US Secret Service, Micro-Uzis are available in open-bolt or closed-bolt versions. The weapon has an additional tungsten weight on the bolt to slow the rate of fire, which would otherwise make such a lightweight weapon uncontrollable. 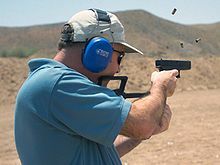 A man fires a fully automatic 9×19mm Glock 18 machine pistol with a shoulder stock. The 9 mm Parabellum Glock 18 is a select-fire variant of the Glock 17, developed in 1986 at the request of the Austrian counter-terrorist unit EKO Cobra. This machine pistol has a lever-type fire-control selector switch, installed on the left side, at the rear of the slide, serrated portion (selector lever in the bottom position for continuous fire, top setting for single fire). The firearm is typically used with an extended 33-round capacity magazine and may be fired with or with out a shoulder stock. The pistol's rate of fire in fully automatic mode is approximately 1100–1200 rounds/min. Introduced in 1992, the Steyr TMP (Taktische Maschinenpistole/Tactical Machine Pistol) is a select-fire 9×19mm Parabellum machine pistol manufactured by Steyr Mannlicher of Austria. The magazines come in 15-, 20-, 25-, or 30-round detachable box types. A suppressor can also be fitted. Also introduced in 1992, the 9 mm Parabellum CZ 75 AUTOMATIC is the full-auto version of the CZ75. It has a longer barrel with three vent ports. This machine pistol has a horizontal rail in front of the trigger guard through which a spare 16 or 20 round magazine can be attached and be used as a fore-grip for better control during full automatic firing. During the 1990s, the Russian Stechkin APS was once again put into service, as a weapon for VIP bodyguards and for anti-terrorist hostage rescue teams that needed the capability for full automatic fire in emergencies. Developed in the 1990s and 2000s the personal defense weapon, a compact submachine gun-like firearm which can fire armor-piercing, higher-powered ammunition began to replace the machine pistol as a self-defence side arm for artillery crews, tank crews, and helicopter pilots. Introduced in 2001, the Heckler & Koch MP7 is often called a machine pistol. The MP7 uses a short stroke piston gas system as used on H&K's G36 and HK416 assault rifles, in place of a blow-back system traditionally seen on machine pistols. The MP7 uses 20-, 30- and 40-round magazines and fires 4.6×30mm ammunition which can penetrate soft body armor. Due to the heavy use of polymers in its construction, the MP7 is much lighter than older designs, only 1.2 kg (2.65 lb) with an empty 20 round magazine. The dividing line between machine pistols and compact submachine guns is hard to draw. The term "submachine gun" usually refers to magazine-fed, fully automatic carbines designed to fire pistol cartridges, while the term "machine pistol" usually refers to a fully automatic handgun based weapons. However, many weapons fall into both categories. The Škorpion vz. 61, is often called a submachine gun. However, it is small enough to be carried in a pistol holster and so is also often referred to as a machine pistol. The MAC-10, MAC-11 and the compact versions of the Uzi series have been placed in both classes. 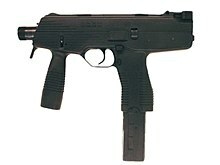 The Steyr TMP (Tactical Machine Pistol) is also called as a compact submachine gun. Likewise, the German Heckler & Koch MP5K also falls in both categories. Personal Defense Weapons (PDWs) such as the Heckler & Koch MP7 are also often called machine pistols. Machine pistols are considered a special purpose weapon with limited utility. Due to their small size, machine pistols are difficult for all but the best shooters to control. As a result, most machine pistols are fitted with an unwieldy detachable shoulder stock. Some, such as the Heckler & Koch VP70, will only fire in semi-automatic unless the stock is attached, because the select-fire mechanism is incorporated into the stock. The VP70 also introduced a three-round-burst limiter to improve controllability. The Beretta 93R not only uses a detachable shoulder stock and a three-round-burst limiter, but also a folding forward hand-grip to improve controllability in full auto. The MAC-10 and MAC-11 use suppressors to reduce muzzle climb, while other designs use a combination of burst limiters, forward hand-grips, ported barrels and muzzle brakes. Gunsite, a US firearms training facility, decided against teaching machine pistol firing when it was founded in 1976. Facility experts believed that it is "a slob's weapon, useful only by half-trained or poorly motivated troops"; they claimed that the machine pistol "hits no harder than a pistol and is no more portable than a rifle." Nevertheless, even the critics from Gunsite concede that the machine pistol is useful for a few situations, such as boarding an enemy boat in low light or when repelling boarders in a naval situation. In the 1970s, International Association of Police Chiefs weapons researcher David Steele criticized the MAC-10's accuracy when he described the MAC series as "fit only for combat in a phone booth". Walt Rauch notes that "... despite the 50 to 70 years of bad press that has accrued to the concept of shooting a hand-held machine pistol", in which critics contend that the weapon will "spray bullets indiscriminately all over the area", he believes that the 2000s-era models such as the Glock 18 are controllable and accurate in full-auto shooting. Leroy Thompson states that "...machine pistols were reasonably good for use from within a vehicle or for issue to VIP [bodyguard] drivers to give them a marginally more effective weapon during an evacuation under fire". However, he also stated that machine pistols are "...(h)ard to control in full-auto fire", which means that there is nothing that a machine pistol "...can do that other weapons available today can't do more efficiently." ^ THE ILLUSTRATED ENCYCLOPEDIA OF HANDGUNS. PISTOLS AND REVOLVERS OF THE WORLD, 1870 TO 1995. by A.B.ZHUK. Translated by N.N. Bobrov. Edited by John Walter. GREENHILL BOOKS, LONDON. 1995. p 176. ^ "MAC-10/MAC-11 Machine Pistol". Cheaperthandirt.com. Archived from the original on 2009-01-12. Retrieved 2009-11-05. ^ Hogg, Ian V.; John Weeks (2000). Military small arms of the 20th century (7th ed.). Iola, Wisconsin: Krause Publications. pp. 63–64. ISBN 978-0-87341-824-9. ^ "Modern Firearms — IMI UZI / Mini UZI / Micro UZI submachine gun". World.guns.ru. Retrieved 2009-11-05. ^ Hogg, Ian V.; John Weeks (2000). Military small arms of the 20th century (7th ed.). Iola, Wisconsin: Krause Publications. p. 99. ISBN 9780873418249. ^ Hogg, Ian V.; John Weeks (2000). Military small arms of the 20th century (7th ed.). Iola, Wisconsin: Krause Publications. pp. 122–123. ISBN 9780873418249. ^ Rauch, Walt. "GLOCK 18". Remtek.com. Retrieved 2009-11-05. ^ Thompson, Leroy (October 2010). "The Machine Pistol - Why Does It Even Exist?". S.W.A.T. Magazine. Mullin, Timothy J. The Fighting Submachine Gun, Machine Pistol, and Shotgun. Boulder: Paladin Press, 1999. Gotz, Hans Dieter. German Military Rifles and Machine Pistols, 1871-1945, Schiffer Publishing, Ltd. West Chester, Pennsylvania, 1990. Henrotin, Gerard Full-auto Conversion for Browning Pistols, HLebooks.com (downloadable ebook), 2003.